Click on the subject of your choice! They have provoked the Lord with their deeds! Obviously Prejudice, pride and presumptuous lifestyles are not in order with God! Lakeland...Your works are neither cold nor hot! Christianity is not just something you experience only on Sunday-morning! O Lakeland, you that ignore and neglect the prophets, and despise them! Man is responsible for his own destiny! Today’s Churches and Ministries have not met the nearby any of the conditions! Humility is not related to poverty! Jonah and his mission for Nineveh is the example for Lakeland! Jonah had one of the greatest preaching anointing given to man! TODAY God is sending His "Jonah's" to revive Lakeland! Those who have a pure heart will discern what is pure! Place of Revival - some important points to consider! You are in a great need to do business with God on His terms! God knows all the secret things about man: His secrets; imaginations; thoughts; deceitfulness and intents of his heart! All the ways; works; every word; the tongue and actions of man! Even man would fill their mouth with arguments if God would only give him a fair trial! But all former arguments are fading away in God’s presence and all they can do is lay his hand upon their mouths, bringing them to complete silence and acknowledgement of their vileness. After the barrage and humility man will come to complete repentance! It will be easy to blame God in time of trouble! “Why did you get us in disaster these last times?” The truth is that the Lord did not lead the people into the disaster. They led themselves into it! Much evil is among them by doing things that will bring even personal disasters upon themselves. It will be difficult to undo this evil. That is the main reason we must plead with God to lead us out of, or through, our troubles. By lack of Divine wisdom it will not free us from getting into trouble or to get us out of trouble! Lakeland's Churches, ministries and "people of God" or what they proclaim to be, has provoked the Lord with their deeds. The sin of the people and their leaders, who suppose to give the right guidance, has grieved the Holy Spirit deeply, for they have turned their back to God! Instead of looking for His face, in spite off, God has faithfully taught them, they have refuse to listen and learn from Him. Having prejudice attitude against His messengers and each other! To the Lakeland's Churches, ministries and "people of God" or what they proclaim to be in Lakeland! Prejudice, strictly defined, a preformed and unsubstantiated judgment or opinion about an individual or a group most often unfavorable in nature or hostile attitude toward other people based on their membership or nation of origin in another social or ethnic group! In most cases, a prejudiced attitude held by a dominant ethnic group against a minority or disadvantaged group within the same society results in various forms of discrimination. Throughout United States history many other groups have suffered racial or religious discrimination. Being disrespectful for those who attend religious services whether they are members of or visitors to that specific congregation! Also because of the Denominational walls many other religious groups and ministers have been neglected and rejected as well. Religious leaders are having prejudice attitudes against foreigners and disfavored minorities within their borders. It may be religious, such as policies that foreigners, who do not speak “perfect American”! (?) The clamor of our own thoughts; imaginations; feelings and ideas are still overwhelming us!? Mostly it is subjected to the delusions, deceptions and selfish ambitions! Is it nothing more than a hidden form of hypocrisy. What is it that makes these people think, "they are better!"? Obviously Prejudice, pride and presumptuous lifestyles are not in order with God! As a response of sowing these kinds of evil seeds they will reap accordingly what they sow! It is going to expel the evil that has been sown in it and will be a manifestation of that specific nature of evil that is growing in these men! The physical damage is already done! "Lakeland"! ...you need to repent! Your works are neither cold nor hot! You showed yourself humble but it is a false humility, because you are proud, self-satisfied and ignorant of the true! You are like the Laodicean church; neither completely dead nor full of zeal, but indifferent and careless! You are thinking: “I am rich” and increased with goods for personal gain and saying: I have need of nothing”! No more than a big "Show off"! Material as well spiritual! Those who love their own comfort lifestyle in sin and their prosperity more than the Lord, will soon know His resistance to them! You are in a great need to do business with God on His terms! God paid the price of redemption! Man is now obligated to meet God's terms of faith, repentance, and service if He wants to be (continued) redeemed! That includes also paying the price of renouncing satan, repenting of your sins, and consecrating to God in face of preparing suffering persecution such as Christians must suffer for Yeshua Messiah! The acknowledgement is there also that you had repeatedly refused to listen to God or obey Him. Instead you went your own presumptuous way! You will reap according what you sow! And it is going to expel the evil that has been sown in it and will be manifested! If any man hear His voice and open the door of his heart, He will come in to you! Christianity is not just something you experience only on Sunday-morning; it is a daily fellowship with Yeshua Messiah or the Lord Jesus Christ. It is Not about chasing members & $ from others! In the final analysis (Judgment Day) man is responsible for his own destiny (Revelation 22:17). Those who hear; who are thirsty and those who will come! Without any exception, all people are invited to come to God freely! He is held accountable for his salvation or damnation has his own will to exercise in this matter! People are commanded to choose God! If they do not choose God than they are to be cursed! (Outside the presence of God) It is impossible to serve God and satan at the same time? Promises are given to people upon the basis of their choice! Man's relationship with God is entirely on a voluntary basis! He is responsible to God for his every act. He has freedom of (moral) action concerning right and wrong and that he is free to choose his own destiny! For God would not that you should be ignorant, lest you should be “wise” in your own conceits; that you become blind and presumptuous! Millions trust themselves, some religion, a denomination, secret order, lodge, or program and despise all others who do not have the 'same faith' or belong to the order!? Thus they were growing in law, in organizations etc. …but not in grace!? It is a weak thing to rely upon! It is walking like a horse with 'blinders' before its eyes! If “God’s people”, which are called by His Holy Name, shall humble themselves, pray, and seek again Gods face, and turn from their wicked ways; then will He hear from heaven, and will forgive their sin, and will heal this City. You will see Him when you turn from your wicked ways to Him and accept Him (again) as your Messiah and live according His principles! You need to turn from your wicked ways and presumptuousness and to humble yourself before the Throne of God, seeking God's face praying to God for His Divine interference! Since Lakeland’ today’s Churches and Ministries have not met the nearby any of the conditions still the blessings are waiting when these simple conditions are met! Likewise Jeremiah he was confronted with backsliding and the dangers of apostasy of ancient Jerusalem. He was a radical prophet having continuous open warfare with God’s own people! His theme seems to be that of judgment without mercy for those who become apostates and defy God. His messages repeatedly refer to the immediate Babylonian captivity! The purpose is to make clear to ancient Israel the consequences of sin and apostasy; to reveal to them their own future in the plan of God for man; and to emphasize the fact that the destiny of every man is determined by his conformity or lack of conformity to God and His plan! This need to be taken serious for consideration in the same way for today’s Churches and Ministries in this City! From generation to generation the depth of sin has taken deep root in man! You are created to walk with God, as Adam did in the Garden of Eden, before his fall! We are reaping the consequences of sin by disobedience. Death is spread throughout each generation! But… we have also beheld the Cross of redemption and have victory over sin! That will include not only redemption, but also a major change: removal of sin! If we accept the Lord on His terms! When truth is spoken in Godly love is rejected, death has been chosen over life! Obedience to God will bring life! Every little remark or negative comparison with poverty cannot based from the scripture! It has to do with your attitude toward God and one another! Humility is not related to poverty, but to a broken spirit; accomplished through God’s dealings and signified as a person submitted to God! Those who love their own comfort lifestyle in sin and their prosperity more than the Lord will soon know His resistance to them! These people will not able to stand in the times that are coming now and already are! Prosperity can be one of the major strongholds on God’s people! 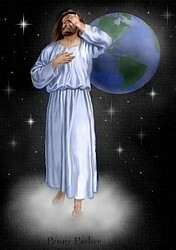 If they looking still for Him during times of prosperity He is willing to entrust you with more of His Kingdom as well! There is a different in the prosperity of given by God or from the prince of evil! If the Lord cannot trust you with Earthly prosperity, how can He trust you with His Heavenly riches for the times that are coming? Nineveh is the subject for the Prophet Jonah. Let them turn every one from his evil way, and from the violence that is in their hands. Jonah knew that his God was merciful and that is why he was fleeing; he did not want Him to show mercy to the enemies of his people. He wanted them destroyed (Jonah 4:2), but it would be unlike God to fail or refuse to warn man of coming destruction and give him an opportunity to avoid it! A bigoted Jewish Prophet who, after being chastened by the Lord for disobedience, preached to and converted the whole city of Nineveh! The illustration of the fact that God's mercy and salvation are for both Jews and Gentiles who will repent and turn to Him! It seems to be in the first impression Jonah’s action was a great folly, but not as foolish as many still are thinking. He had to understand the reality of God’s (Fire-burning) presence and the responsibility as response. Jonah had one of the greatest preaching anointing given to man! Without miracles or signs, when he preached, one of the most wicked cities, Nineveh, that ever existed! Maybe, if Jonah should preach in Sodom, that city would have remained until today! When he awakened and was vomited out of the beast, he had this power! you did it not to Him! The reason and basis of the judgment is neglecting & rejecting of God’s anointed prophets. God will curse or bless according to how men have dealt with them! To accept, approve, embrace, give ear to the Prophet or minister, including his message and also embracing it as truth. If he will preach Yeshua Messiah and God, both will be received if he is received. If men will not hear of Christ or God they will not receive the minister sent by them as well! "By their fruits ye shall know them" (Matthew 7:15-20) Even the minutest details of goodness, if done for the right person and with the right motive, will be rewarded! You have to hear and obey the words of His messengers the Prophets that are from God without any delay or neglects! To reject or to neglect and showing no ears for His messengers will respond in disobeying God and will bring a more severe judgment upon you! Saying, Touch not Mine anointed, and do My prophets no harm. (Psalm 105:15) (1 Chronicles 16:22) God is using messengers to teach, to edify, to correct, to warn and to encourage His people, so that they will live in righteous judgment! The results by lack of discernment and Divine wisdom are often misinterpreted and misapplying of prophecy, which results also in rejection. God’s real people have to learn to discern the distinguishing between real prophecy and presumption (false prophecy)! True Prophets and true prophecy will always be shadowed by the false! The enemy sows his tares among the wheat. Those who love the true will discern what is true, and those who have a pure heart will discern what is pure! A Revival consists in the return of the Church and their people from her backsliding and apostasy state! In this kind of state - Churches are not able to awakened and have revival right away without first deep serious and honest searching's of their own hearts! By the coming Revival Lakeland people of God, who had visit the places of Revival in Lakeland, are coming under such a conviction of the Holy Spirit, that they can see the state of their own hearts and their own sins, whatever it could be, under such a Light that they are going to realize under great conviction their "far distance relationship" with God! A new sacrificial attitude toward God! A new beginning and new acceptance with God is just born! This is a painful process! While they were still in backslidden state their were blind to their own state of sin! In this revival many will come out of their backslidden state and renew their love of God in their hearts! The Revival-Fire is burning in their hearts and they are changed dramatically! They have got a new foretaste of the Fire strait from Heaven! The All-consuming FIRE of God will burn, deep, deeper in our hearts so that every religious spirit will be burned and consumed! So that freedom comes back into the Lakeland - churches and in our lives! There will be a closer and deeper walk with God for those who are coming under His Revival-Fire! It’s now time to prophesy and speak unto to the dry bones, to come alive! (Ezekiel 37) A deeper work from God, through His capable no compromising ministers! It means to remove all stubbornness in the nature against God, stopping all opposition to Him and to His anointed Prophets and messengers, and not stiff-necked anymore! A cleansing FIRE, Revival-Fire, Purifying FIRE, for those who keep their faith in God! Holy Revival-Fire is a sanctifying, Holy Divine work in the lives and souls of those at the Revivals! who had paid a price! ready for the End-Time- invasion! The Lord, King of kings; of war is rallying His Divisions of His large End-Time Harvest Revival - Army! He is calling you today as one of the many to be part of this End-Time -Generation! Planet Earth is going to have a Divine invasion from the Heavenly Host! The warrior Lord's Army represent men & women of holy anointed useful "vessels" to usher in the Kingdom so that no man can take credit for it! It is for the Glory of God alone! No apostle or prophet who ever lived, equaled the power anointing of these End-Time-Harvest-Revival - Men & women...! ...To these people God will give the authority for the Revival in Lakeland in these last days! These precious saints will not make compromises to get favor, to get money, to get positions! There were rejected at the most of your Churches and ministries and by your own people! They were "Not good enough" in your opinion! Therefore in order to receive Revival-Fire the Churches inclusive their leaders needed to come out of their Denominational barriers and must come at the place of Revival! In the first place it will be on several locations in Lakeland Down-town! You cannot limit yourself to your own denomination, or own designed programs and reject all others! Revival is based on Godly principles and in grace, and is not limited in Church denominational barriers! Therefore the Revival in Lakeland will start basically on "neutral ground" outside the Church! Everyone who is hungry & thirsty for God can come. It will be spontaneous guided by the Holy Spirit! No one can claim it! Not us or anyone else! (See important point’s below) There is still a raiment of Churches, just a few, who are looking after His righteousness! He will not forget them! To humble yourself before the Throne of God & seeking His face! Revival belongs to God only, no one can claim it! Not us or anyone else! In order to receive Revival-Fire you need to come at the place of Revival! You need to have a sacrificial attitude! You need to wear the cloths of “humility”! We believe the Revival-Fire will start in Lakeland Area! It will be spontaneous guided by the Holy Spirit! Everyone who is hungry & thirsty for God can come. Prejudice is not tolerated; you will not receive from God either! It is not about position, but serving! Turning from your wicked ways and presumptuousness! Communication to God; communication from God! You need to be real with God, no hypocritisme! It is not about religion or traditions, but real expressions from Heaven! A Revival can not exist, without prayers by fervent (hot-hearted) Christians! That's why God requires intercessors for the lost souls and backsliders! If Christians are so ignorant or neglect the knockings of the Holy Spirit on the door of their hearts, then they don't realize that they often grieve the Holy Spirit and don't really cherish and yield to His influences. How can such Christians expect God's blessing and His answers to their prayers? You have to hunger so after the Lord and His presence, that you become more and more willing to set aside anything that is not pleasing God! He will cleanse them from all their iniquity and sins. He will pardon their iniquities whereby they have sinned. He will bring health and cure to the city! He will reveal unto them the abundance of peace and truth. It will be to Him a name of joy, praise and an honor before His Throne! They will fear and tremble for all the goodness and prosperity that God procure unto it. Again the voice of joy and happiness will be heard in this place! They will sing out & say: “Praise the Lord of hosts: for the Lord is good; for His mercy endures forever”! Again in this place, which is desolate, will be a habitation of “shepherds” causing their “flocks” to lie down! He will execute judgment and righteousness in this City! In those days many will be saved, and they will dwell safely! The City of Lakeland will cry out: “The Lord our righteousness”. God longs to see His people in Lakeland to be blessed and to be restored! When Revival is at hand, a great multitude of people (lost souls, backsliders, people hungry for the Word, etc..) are coming on your way! As the “fishermen's nets” were at the point of breaking! Rabbi, Pastors, leaders, deacons, ministers, or whatever your responsibility may be! You have to prepare, because we are not able to take the complete harvest in "our" place only, because it will be so overwhelming! There shall be a great need to organize the order into the Lakeland cooperative Churches and ministries, to place the new converted and give them a "Home"! Naturally the warnings like in this site "Awake Lakeland" seemed unpatriotic to the local Church leaders of this City. Many will reject and neglect even angrily the Prophet's message! Yet, in spite of, I will continue to speak what God has revealed to me. God will deal with those who have falsely prophesied "that there will be no trouble"! You have just look around you! No trouble??? I spoke for God! His Words and they became like burning FIRE! But there are people with a prejudice attitudes, waiting for "my failure" (???). Truth sometimes hurts! When it does we are tempted to want good news, even in spite off, it is not true. This is even foolish for ourselves! Just as today, times were filled with trouble. Just as today will feel the treat of "modern terrorism, natural disasters, etc. living under a dark cloud people are anxious for good news false humility and false messengers will smoothly tell you that all is still OK! Giving you the good news maybe you wanted so much! Foolish! For the largest part Christianity in this nation is foolish enough to do the same! Including those who come with their well-pleasing compromising message to impress predicting peace and good times! It not only what the people want to hear, it is also what they ("want to") believe! ...Fools! I want to continue to be loyal and bold to the Lord...only and telling a un-compromising message strait from Him...only! That people, especially Church people are finding themselves in a unhappy situation, responding with despise, neglect and rejection,......I can deal with that! This occur when people wants only "good news" so much that they are willing to reject truth to get it! Comforting themselves, but it is foolish yourself! Truth may be good or bad news! We must learn to accept the truth, in spite of bad news, if we will expect long-range Godly prosperity and protection in our lives! We need to have the Divine Wisdom and discernment to reject supposal "good news", for the truth alone has to come only from God! There is a related site "Brokenness" & the site (Prophecies!) of "Wearing the clothes of humility"! This "Neutral" site of "Awake Lakeland!..."